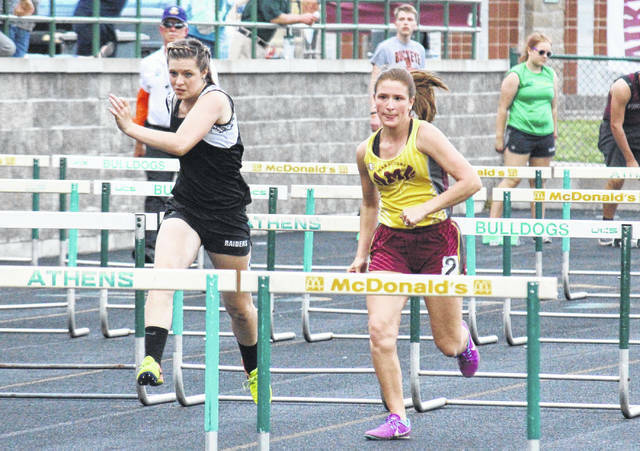 River Valley sophomore Gabrielle Gibson (left) and Meigs junior Lydia Edwards (right) run in the 100m hurdles, at the TVC Ohio Championships on Wednesday in The Plains, Ohio. THE PLAINS, Ohio — A dynasty continues, while a new champion arises. 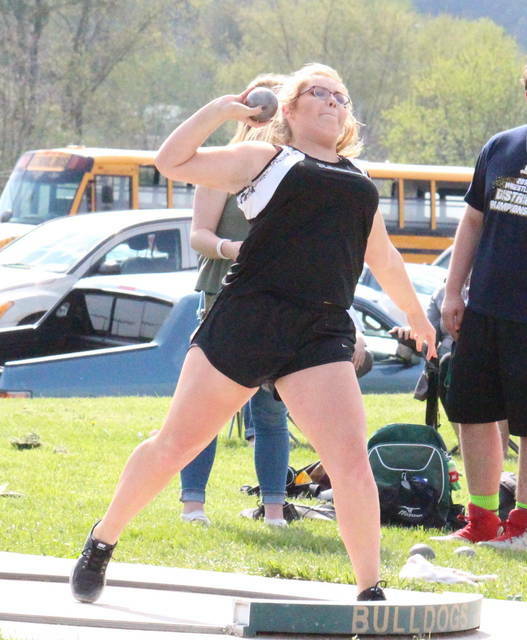 The Athens girls and Nelsonville-York boys won the team titles at the Tri-Valley Conference Ohio Division championships on Wednesday at AHS, giving the Lady Bulldogs a 10th straight and the Buckeyes their first. The host Lady Bulldogs posted a team score of 195, a full 88 points ahead of second place Vinton County. The Lady Raiders were third with 72, followed by Nelsonville-York with 58, Meigs with 54 and Alexander with 40. River Valley had one girls relay team finish in the top-4, the 4x400m quartet of Rakia Penick, Hannah Culpepper, Kenzie Baker and Savannah Reese, which claimed fourth with a time of 4:47.4. River Valley’s only event champion was Madison Tabor, whose shot put distance of 33-2¾ was just 1¾ ahead of runner-up teammate Kelsey Brown. Also picking up runner-up finishes for the Lady Raiders were Reese with a time of 1:05.6 in the 400m dash, and Jenna Burke with a height of 8-2 in the pole vault. 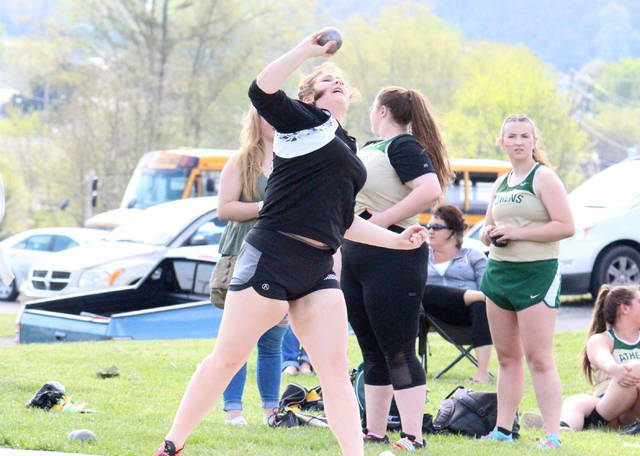 Elisabeth Moffett was third in the discus throw with a distance of 95-3 for the Lady Raiders, while Baker was fourth in the 1600m run at 6:04.4 and fourth in the 3200m run at 13:06.32. Taylor Huck was fourth in the pole vault with a height of 7-6 for RVHS, while Alyssa Lollathin placed fourth in the 300m hurdles with a time of 54.71. 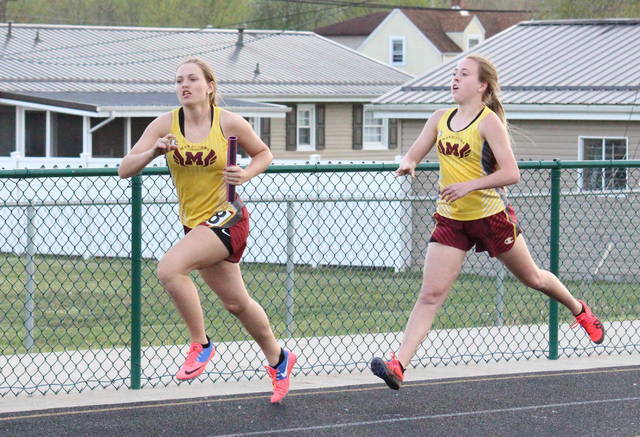 The Lady Marauders finished the in the top-4 in three of the four relay events, with the team of Madison Cremeans, Kassidy Betzing, Lydia Edwards and Taylor Swartz finishing third in 4x100m with a time of 53.84, and the team of Cremeans, Betzing, Swartz and Madison Fields placing third in the 4x200m with a time of 1:54.46. The MHS 4x800m relay squad of Caitlyn Rest, Carmen Doherty, Alexus Metheney and Ariann Sizemore was fourth with a time of 12:45.69. With the MHS girls’ only championship, Betzing set a new TVC meet record with a leap of 17-7½ in the long jump. Betzing was also third in the 100m dash with a time of 13.53. 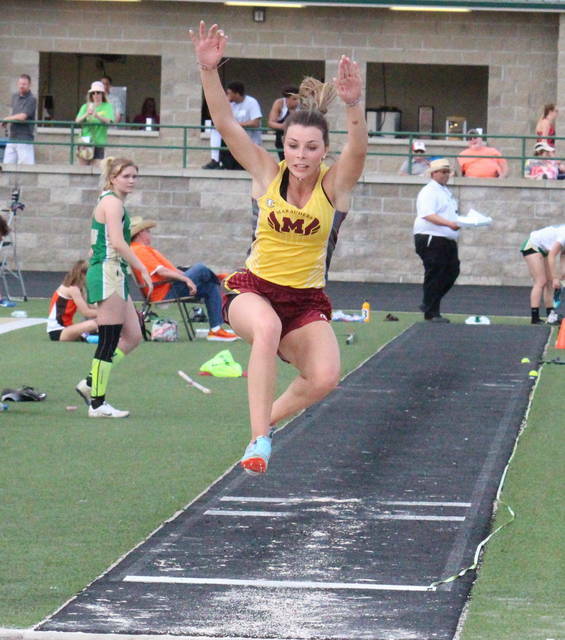 Also in the long jump for Meigs, Swartz was third with a leap of 16-00½. Fields was third in the 400m dash with a time of 1:06.45, while Edwards claimed fourth in the 100m hurdles with a time of 18.61. In the boys team competition, the Buckeyes’ winning total was 168, a full 45 ahead of runner-up Athens. Alexander was third with 62, followed by Vinton County with 60.5, River Valley with 57, Meigs with 38.5 and Wellston with 18. 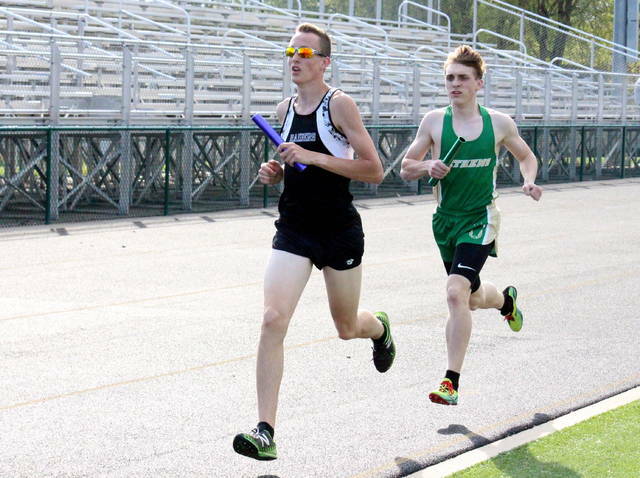 The Raiders claimed second in the 4x800m relay, as the team of Kyle Coen, Brandon Call, Nathaniel Abbott and George Rickett turned in a time of 8:42.23. In the 4x400m relay, the team of Call, Abbott, Caleb McKnight and Rory Twyman was third with a time of 3:45.49. Individually for RVHS, Abbott finished second in the 800m run with a time of 2:00.54, and third in the 3200m run with a time of 10:47.46. 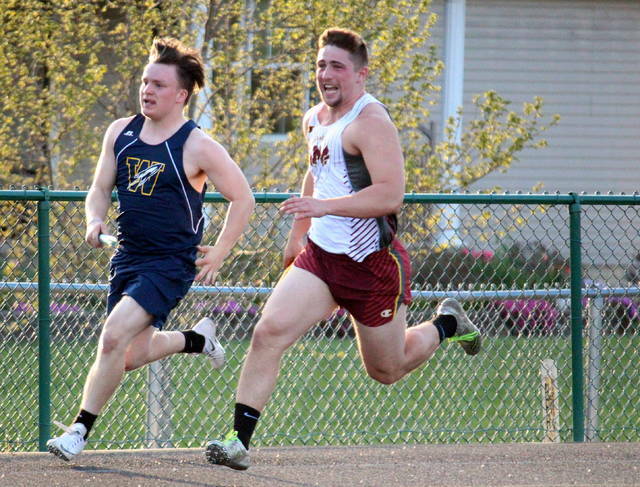 Eric Weber was second in the discus throw with a distance of 133-7 for River Valley, while Ty VanSickle was third in the shot put at 40-5¾. Finishing fourth for the Raiders, Jacob Edwards put up a height of 9-6 in the pole vault, and Kyle Coen ran the 1600m in 5:04.97. 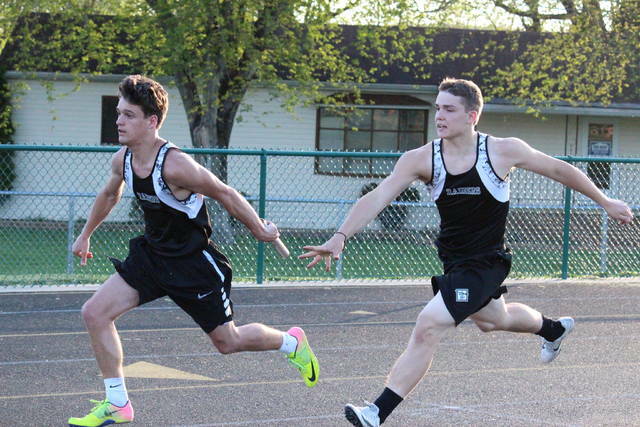 The Marauders’ top finishing relay was the quartet of Lane Cullums, Devon Hawley, Theo McElroy and Magnus McDaniel, with a fourth place time of 47.03 in the 4x100m. 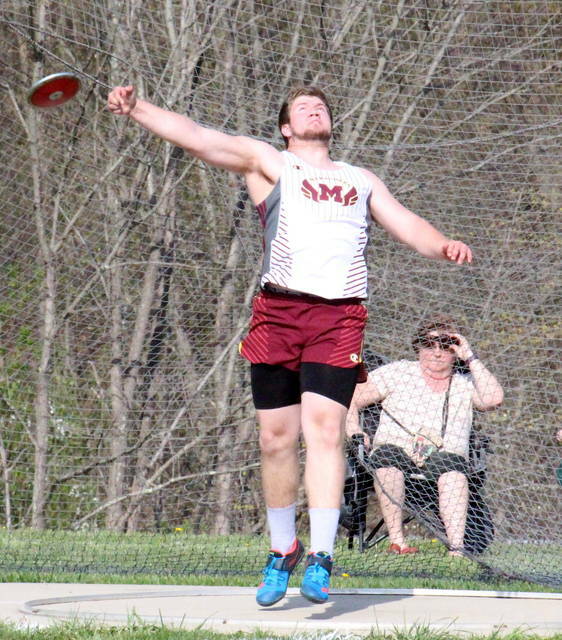 The MHS boys had a pair of champions, with Matthew Jackson posting a distance of 136-9 in the discus throw, and Riley Ogdin recording a distance of 45-5½ in the shot put. With a second place finish for Meigs, Bailey Caruthers cleared 6-0 in the high jump. Visit www.baumspage.com for complete results of the 2018 TVC Ohio Championships.